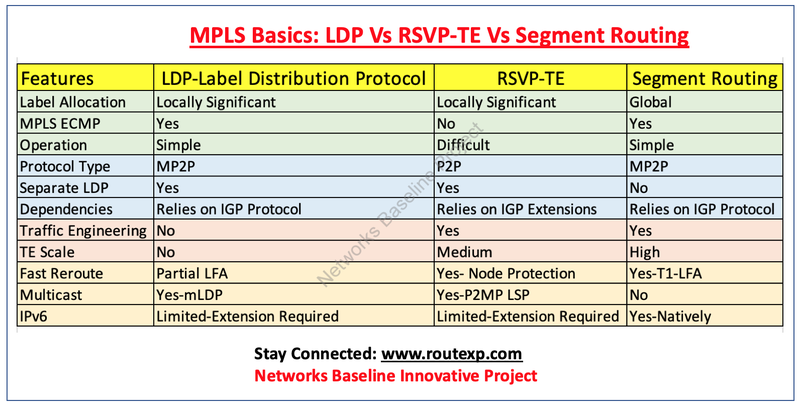 As we discussed about Segment Routing in our earlier article, Today I am going to talk about the difference between Segment routing with Label Distribution Protocol (LDP) and RSVP-TE (MPLS Traffic Engineering). 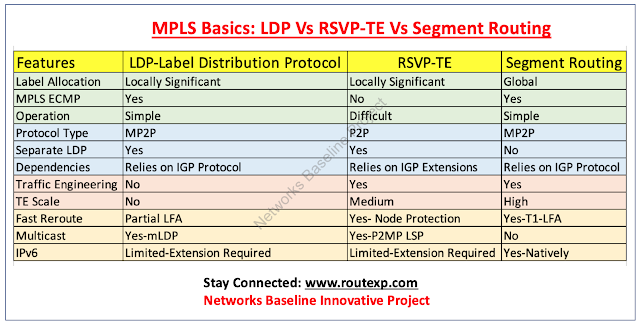 Most of you know about Label Distribution Protocol (LDP) and RSVP-TE used in the MPLS scenario. In this article we will discuss how Segment routing differ from Label Distribution Protocol (LDP) and RSVP-TE. Label Distribution Protocol (LDP) create and maintain the label-to-forwarding equivalence class (FEC) bindings along the label switched path (LSP) from MPLS ingress label-switching router (LSR) to MPLS egress LSR. MPLS Traffic Engineering uses RSVP-TE and CR-LDP protocol. It uses IP datagrams (or UDP at the margins of the network) to communicate between LSR peers. It does not require the maintenance of TCP sessions, but as a consequence of this it must handle the loss of control messages. RSVP-TE calls for that each one acquired IP packets sporting RSVP-TE messages are added to the RSVP protocol code without reference to the real destination IP address in the packet. this feature might also require a minor modification to the IP implementation. The main differences between CR-LDP and RSVP-TE is the reliability of the underlying transport protocol, whether the resource reservations are done in the forward or reverse direction. From these points come many of the other functional differences. CR-LDP inherits any safety carried out to TCP. RSVP-TE cannot use IPSEC however has its own authentication Multicast support is presently not defined for any of the existing label distribution protocols. The maximum obvious distinction among CR-LDP and RSVP-TE is the selection of delivery protocol used to distribute the label requests. RSVP uses connectionless raw IP (or UDP packets on the margins of the community). CR-LDP uses UDP to discover MPLS neighbors and makes use of connection-orientated TCP classes to distribute label requests. Segment routing is a method by which the path followed by a packet is encoded in the packet itself similar to lose or strict source routing. The path is encoded as a list of segments, and each segment is identified by the segment ID (SID) consisting of a flat unsigned 32-bit integer. Interior Gateway Protocols (IGP) segments, a sub-class of segments, identify an IGP forwarding instruction. Segment routing is a network technology that offers enhanced packet forwarding behavior while lessening the requirement for preserving responsiveness of mass volumes of network state. Segment routing contents crucial necessities for application-enabled routing in software defined networks, including the capability to deliver strict network performance guarantees, well-organized use of network resources and very high scalability for application-based transactions. Segment routing trusts on a small number of extensions to Intermediate System-to-Intermediate System (IS-IS) and Open Shortest Path First (OSPF) and can drive with an MPLS or an IPv6 data plane. It incorporates with the rich multi-service capabilities of MPLS such as Layer 3 VPN (L3VPN), Virtual Private Wire Service (VPWS) and Virtual Private LAN Service (VPLS) / Easy VPN (E-VPN). It’s an establishment for application engineered routing because it prepares the networks for new business models where applications can direct network behavior. Segment routing requests the right balance between distributed intelligence and centralized optimization and programming. It was built for the software-defined networking (SDN) era. 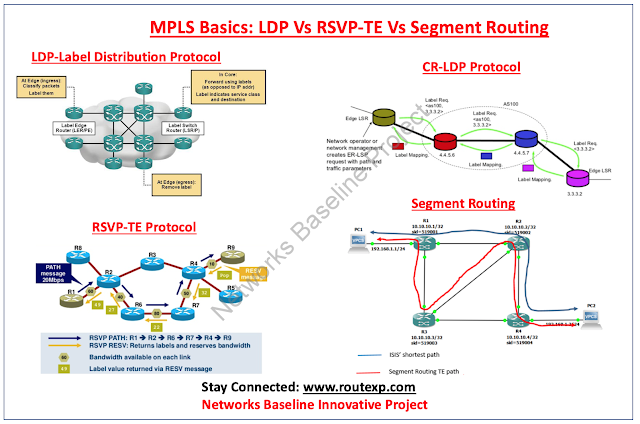 Difference between Label Distribution Protocol (LDP), MPLS-TE(RSVP-TE) and Segment routing? Below table shows the comparison or difference between these three technologies in the MPLS.